Some websites are very popular with they are selling fonts to the people but some websites are very best to giving their font with free of cost. In that websites I am telling about one of them. This website giving lot of styles of fonts with free of cost. The website link is given below. 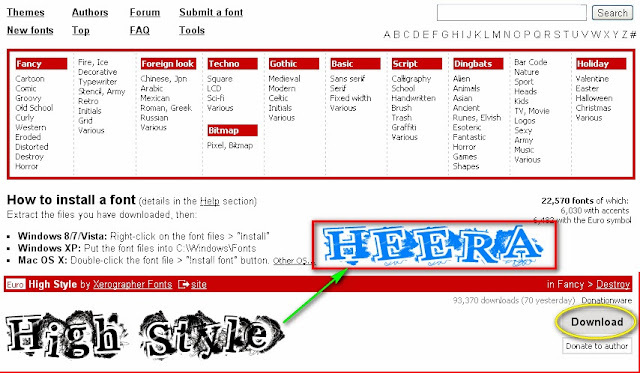 In the above link there are lot of fonts like Hand writing, School Writing, Fancy fonts and Cartoon type fonts etc. if you want to a very likable font for you just click on the font as you like and there will be shown the font styles with different letters and angles. And if you want just click on Download Button. After download the font (.rar file) extract with the WinRAR or any other extractors. There have a file call TTF (True Type Fonts). Copy this file and paste in the C:/windows/fonts folder or right click the file and click on Install . That’s it it’s installed. Open word or Photoshop or any software which is mainly used for Typing. And select the font which is you downloaded. And type with that font. Enjoy……..